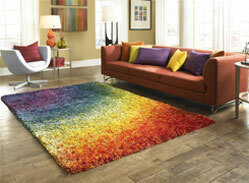 Contemporary (Modern) rugs are like an artist’s palette with unusual design elements and typically bold colors. Many contemporary rugs are indeed unique works of art. 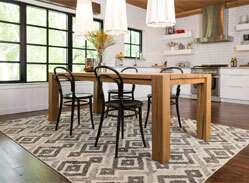 These rugs are perfect for an upscale modern space. Chevrons, bold patterns and stripes in an endless variety of designs make sure that you can find a rug to make your room special. Traditional rug designs are typically European and Asian patterns and may contain medallions in octagon diamond, and hexagon shapes. These rugs usually contain borders, floral motifs and other intricate patterns. 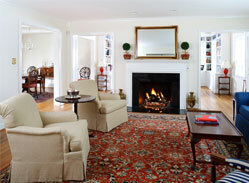 Traditional rugs are more formal in appearance but also work quite well in casual living areas. Transitional rugs are considered to be between traditional and contemporary and not held to any strict formula. Most transitional rugs have irregular, floral or geometric styled patterns and usually don’t have borders. 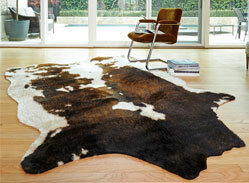 These rugs are very popular and there is a design for every room and taste. Create an interesting accent in your room with a great animal print rug. Great for a cushiony feeling underfoot or just use like a layered throw on your bed. These typically hand tufted rugs come in a variety of materials from acrylic, polypropylene, polyester, nylon and sometimes wool. They appear so real that you’ll want to pet them the instant you see them. The sky’s the limit with floral pattern rugs. Floral motif is used across all styles of rugs and most frequently seen in Transitional and Contemporary (Modern) rugs. Beautiful floral rugs come in many materials for indoor as well as an outdoor accent to your patio. There is a wide palate of fun colors and shapes for any kid’s room. From bubblegum pink to wild purple and many patterns and styles, you will love them all. Many of these rugs are made in stain resistant and durable material for those playtime accidental spills. Outdoor rugs are no longer the bland styles of years ago. A rainbow of colors and patterns are available to accent any patio or outdoor space. 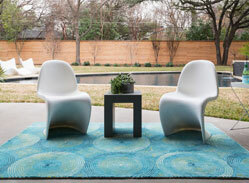 Most of the modern outdoor rugs are now stain and fade resistant. Easy to clean by just washing them down with a hose. Shag rugs are back and the modern interpretations of a shag rug have opened up a whole new range of décor possibilities. From short shag to long shag and raised, high low contouring, there’s a shag rug for every décor in an endless range of colors, patterns and materials. 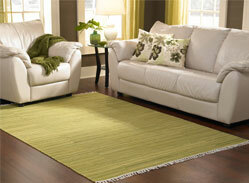 There are a great variety of solid rugs available in many colors and many different materials. From hand made to machine made there is a rug to suit any room and décor. 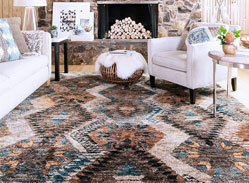 Welcome to a rich American heritage of bright, warm Southwest rugs. Since the early days various American Indian tribes and Spanish peoples were creating beautiful rugs usually based on their geographic area. These rugs are not fully contemporary and not traditional either. They have a bright, warm look of reds, yellows, greens, dusky orange and desert hues. Pillows. 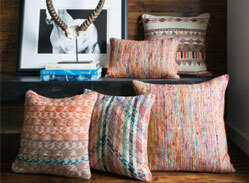 Wow, do we have pillows; jeweled, plain, fancy and every color and décor combination. We have pillows for every décor from a mansion, to a patio, to a tree house! Rug Pads typically come in nine sizes and four types. A rug pad is a must have with your rug. 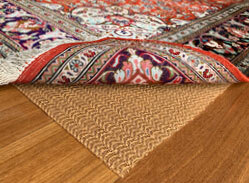 The life of your rug can decrease dramatically if you don’t use a rug pad. Even on an outdoor patio you still need a rug pad. Rug pads provide cushioning, extend the life of the rug, prevent slipping, protect the floor from dye transfer, and allow for easier vacuuming.